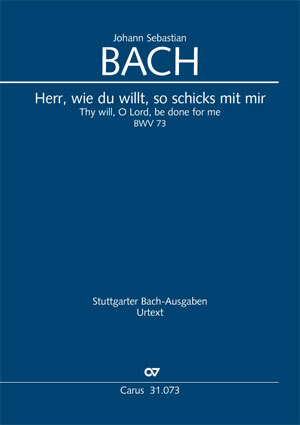 In 1724, Bach composed the cantata "Herr, wie du willt, so schicks mit mir" [Lord, as you will, do unto me] BWV 73 for the third Epiphany Sunday. 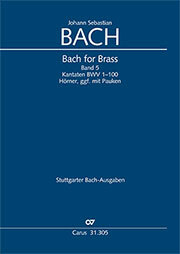 Like in some other cantatas from the first annual cycle, the opening movement contains a part for corno which would in fact have been unplayable on an instrument of that era – probably also a reason why Bach allocated this part to the organ in a repeat performance (both variants can be performed using the Carus edition). The unusual choral movement, interrupted by recitatives, is based quite substantially on a short four-note motive which is introduced by the horn; at the end of the chorus, the choir sings it to the words "Herr, wie du willt" [Lord, as you will] – an avowal which also quite substantially characterizes other movements of the cantata.